Happy the democracy waging an election with little argument about foreign affairs and defence. The outside world isn’t pressing too hard. The threats are far off and chances are good. A democracy that dwells inward agrees on the big external issues, based on bipartisan consensus in the polity and a matching comfort among voters. 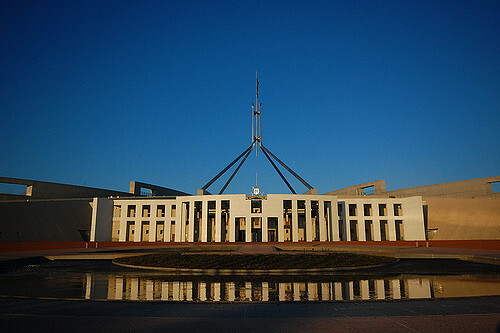 This is the significance of the sparse foreign and defence debate in the Australian election. Comfort and consensus rule. Such was the amiable tone  of the debate between the Defence Minister and her Labor shadow. China throbs but a Liberal–Labor unity ticket prevails—don’t talk too loudly about the potential dark side. No rows over international policy mean much is agreed. Or—as with illegal boat arrivals and asylum seekers—argued to a tough common position that both sides want to own. View the foreign and defence elements of the election through the meaning of the silences. See agreements beneath the noise. Want it. Must have it. Happy to pay lots—in the future. Tick. What’s next? Australians love the slouch hat. They respect their military—and know little about them. Previous generations had an intimate knowledge because of the civilian soldiers of WW1 and WW2. No longer. Still, the sense of ownership lingers. Ignorance isn’t apathy, resting as it does on beliefs and commitments and history—not much discussed, yet pulsing away. The ANZAC mythology matters. Interesting that the other ANZACs have gone to a different place with their defence consensus—the Kiwis don’t need to do as much  because they have Australia. Geography blesses them as it does us. On the potent mix of Asia’s geography and our history, Australia’s political psyche retains the 20th Century moment of truth—the fall of Singapore, the attacks on Darwin, the battle of the Coral Sea and the fight for New Guinea. Coral Bell  got it right, as she usually did, referring to this patch of history that ‘has haunted Australian strategic inquiry ever since.’ The soaring memorial  at the centre of Defence HQ in Canberra is all about that haunting moment. While voters don’t dwell on defence, it’s a core competence. The threshold tests are that a leader and party must be judged able to drive the economy and deliver security. If neither side of politics can dominate on defence (as neither can in this election) they must neutralise the issue. Agree to agree. The consensus between the Coalition and Labor on defence policy and future spending is bipartisanship rendered as harmony. Noting the calmness, glance over your shoulder at the extraordinary denouement a few moments ago when politics collided with geopolitics in Australia’s biggest defence project. The submarine comic opera is bizarre and byzantine business that beggars belief. Fortunate is the democracy that can afford to play around in such a manner. The red hot politics meant the submarine choice had to be announced before the election could be safely launched. Remember that Tony Abbott as PM had a deal with Shinzo Abe to choose the Japanese design . The build would be in Japan with Adelaide adding finishing bolts. If Abbott had been a slightly different leader, that was the sure result. The contest between Abbott’s will and Malcolm Turnbull’s destiny allowed the subs-for-SA-side a comeback triumph. Not the sushi subs. French, instead—all built in Adelaide. The drama has caused nary a campaign ripple. With the decision done, the submarines have hardly surfaced beyond Adelaide. The campaign issue that has featured is the turn back of boats carrying asylum seekers. Labor’s 2015 conference adopted turn backs, but the Coalition pitch to voters is the difference between the policy originator and reluctant converts. The website stated Labor ‘somewhat agrees’ with this position, whereas the Coalition ‘strongly agrees’. Through the campaign Labor has had to hose down candidates whose past positions prove that ‘somewhat agree’ call. Boats and asylum seekers have run through Oz politics in the 21st Century. The 2001 election was all about foreign and defence policy in the fraught days of Tampa and the 9/11 attacks. Today, however, the asylum/boats issue is debated in internal not international terms. In this election, there’s been no discussion of what the issue means for relations with our important neighbour (and source of the boats) Indonesia, apart from one bit of boats-cattle linkage by Deputy PM Barnaby Joyce . Nor a moment’s thought about the impact on Australia’s proud international reputation since WW2 as one of the leading countries for asylum resettlement. The silence or the consensus that sits untouched beneath the boats debate is Australia’s history since WW2 of government-run mass immigration. This year, Australia blithely sailed without fanfare by the 50th anniversary of the moment our immigration policy became colour blind. Harold Holt quietly started demolishing White Australia in March 1966, and Gough Whitlam loudly finished the job. The hard-won Australian consensus on non-discriminatory immigration is little discussed after 50 years. The size of the annual intake is debated—Big Oz versus sustainable Oz—not its merit-not-colour nature. By contrast, Britain’s Brexit debacle has turned into a campaign against legal immigration from Europe. The Poms are in danger of choosing their history over their geography. Australia has adjusted its history to suit its geography. The Oz multicultural diasporas  are a resource as valuable as minerals. No election argument needed.